t*rexes and tiaras: Friday Favourites 263.. I think there is something about the change of season which makes me both a little restless and keen to change things up a little. A new season, a new homeware style. I like nothing better than fresh bedsheets (I get teased all the time about how often I change my bedding) and I think that a change of colour-scheme can make all of the difference. 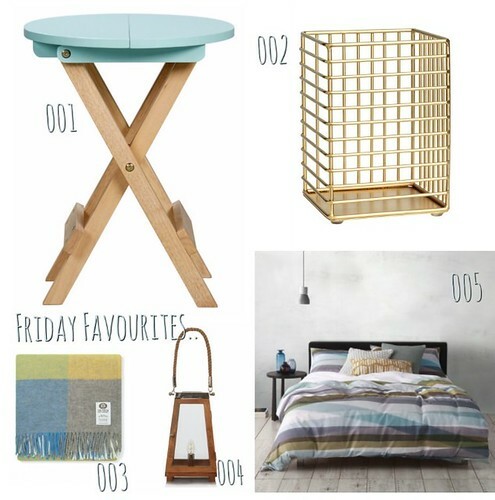 Here are some of the items I think would be perfect to give my bedroom a bit of a style overhaul. 001: I love this little blue folding table. It would be perfect with a lamp or maybe a candle on it, but gives the option to fold it out of the way when the space is needed. 002: Because storage is the thing I just never have enough of - these metal baskets would be perfect for keeping all kinds of bits and bobs, whilst looking stylish. 003: I love the mix of colours in this wool throw - perfect for someone who can't sleep with the windows closed but sometimes gets cold..
004: I love these wooden lamps. They come in a range of sizes, and can stand on the bedside table or the floor. 005: I love the mix of colours in this duvet cover and in fact the way the bed has been styled in this photo is giving me all kinds of décor inspiration. Rooi has a lovely selection of bedding. Does anyone else get the urge to change things around a little when the seasons change?